I think one of the most depressing moments I had while breastfeeding my first baby was the moment I realized that chocolate gave her gas and I could not eat it. Ugg. That was sooo horrible. I seriously had chocolate withdrawal and could not wait to eat it again! Now that I am nursing again, I was worried about my chocolate and whether or not it would affect Isaac. I am very happy to report that he is totally fine with chocolate and encourages me to eat it whenever I need a little "happy boost" to my day. I don't go overboard mind you...just a small smidgen here and there. :) Sweets and I just get along so well!! The history of this confectionery family dates back to 1919, when Chester K. “Chet” Enstrom got his start in the candy business. At 17 years of age, Chet went to work in the ice cream factory at Barthel’s Confectionery in Colorado Springs. Often, when his shift ended, he would help out across the street in the adjacent candy factory, and he quietly began learning the candy-maker’s art. In 1929, Chet and his bride, Vernie, packed up their Model T and drove the rut-filled roads to Grand Junction, Colorado to begin a new life. There Chet and a partner, Harry Jones, launched the Jones-Enstrom Ice Cream Company, a business he pursued for the next thirty years. Meanwhile, Chet also pursued his favorite hobby; handcrafting various confections. His specialty was almond toffee, and he experimented at night and on weekends, brewing up small batches of this hard-to-make treat as a gift for family and friends. 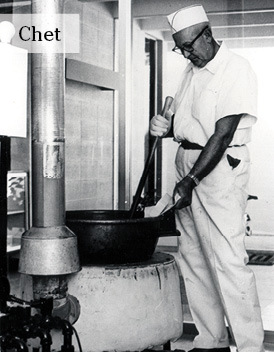 By 1960, his almond toffee had begun to develop a reputation and, at the urging of those early gift-recipients, Chet founded Enstrom Candies. Chet and Vernie planned to make their new “Candy Kitchen” a mom-and-pop operation, but the orders kept flooding in. By 1965, Enstrom’s was shipping almond toffee worldwide and Chet sold the business to his son and daughter-in-law, Emil and Mary Enstrom, so he could pursue a political career in the Colorado State Senate. Under the direction of Emil and Mary, Enstrom Candies thrived. In 1979, their daughter, Jamee and her husband, Doug Simons, joined the Company. In 1990, Chet’s grandson, Rick, and his wife Linda, opened a retail store in Denver’s Cherry Creek North. 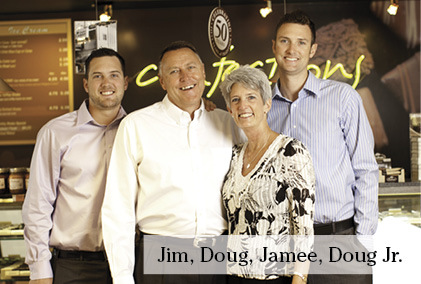 In 1993, Jamee and Doug purchased the business and continued building the Company. 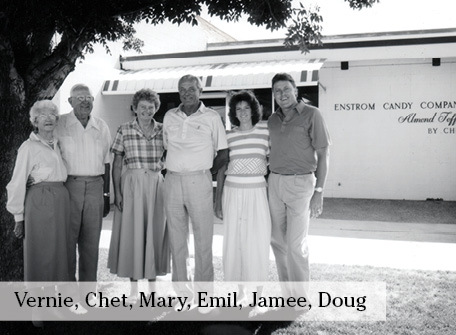 Today, Enstrom Candies remains a family business. Jamee and Doug oversee the operation of the “Candy Kitchen” and retail stores in Grand Junction, Colorado, where every batch of traditional almond toffee is still made by hand with only the finest, freshest ingredients. Rick and Linda manage the Denver-area retail stores. 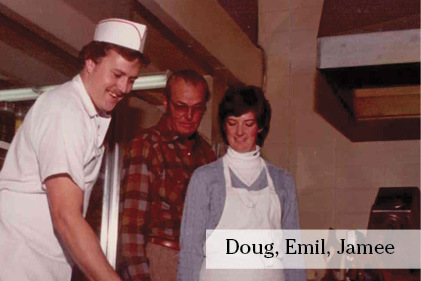 Jamee and Doug are also very proud that their sons, Doug Jr. and Jim, have joined the Company to become the fourth-generation of the family business and are learning the art of what it takes to make world-class confections. 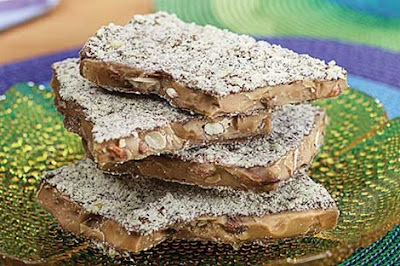 So, when you hear of Enstrom's world famous Almond Toffee, you will know that it truly is famous! My sweet tooth was very excited for the opportunity to review this awesome toffee and I am going to share it with you today! For this review, I was sent a 16 oz box of Enstrom Milk Chocolate Almond Toffee. It arrived on a very hot day and I was unaware that the delivery man had dropped it off. When hubby came home from work he brought it in and I was afraid that it would be a melted mess. BUT, after refrigeration, it was totally fine. Phew! I love the elegant box in which this toffee comes...it would make a great gift for anyone! Inside the box, I found two large pieces of Almond Toffee and it smelled heavenly. I could not wait to try it! As you can see, each block of toffee is coated in yummy milk chocolate. Crushed almonds dust the top of the toffee, which makes it look REALLY yummy! 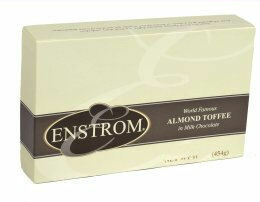 It is important to refrigerate Enstrom's Almond Toffee because it is a dairy confection. Refrigeration keeps it fresh and cool too. My first bite was rich, smooth, sweet, salty and just plain scrumptious. I was sooo excited to share with my hubby when he got home from work! He is not a toffee fan because normally, toffee is crunchy. This particular toffee melts in your mouth and is not difficult to chew at all. The rich flavor of almonds is present in each bite, due to the crushed almonds sprinkled on the top. If you are an almond fan then this is the candy for you!! So, in my opinion...Enstrom is a delicious company! Not only am I a chocolate fan, but I am not an almond toffee fan! I love how classy the candy looks when it arrived at my door and how yummy the toffee was. It is a melt-in-your-mouth candy that will please any one's sweet tooth! Disclaimer: I received no monetary compensation for this post. I did receive free Enstrom Almond Toffee for review purposes. All quotes and stock photos are from the Enstrom website and email. Prize is being provided and shipped by the sponsor. All thoughts and opinions are 100% mine. I'd also love to try the assorted truffles. Yummm....the Classic Chocolate Assortment 30pc 20 oz. looks fabulous, too! I'd love to try the assortment of Dark Chocolate Truffles! 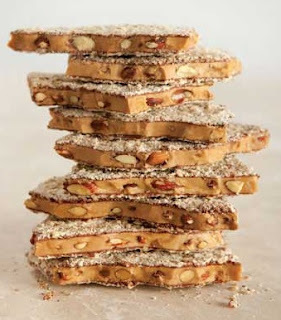 The Almond Toffee petites sound wonderful too. I would also like to try their Almond Toffee Popcorn. I'd also love to try their cream caramels. Their Toffee Popcorn is a must try. I would LOVE the almond toffee! I want to try the mini-turtles. I like the Dark Chocolate Truffle Assortmwent too! Another candy I would like to try is the Enstrom Premium Dark Chocolate Truffles. :-) Thank you. I would like to try their all chocolate assortment. I want to try the Assorted Truffles. All of them sound good, but would like to try the cream caramels. I would love to try the Almond Toffee Petites. Visit Enstrom and tell me another candy of theirs that you would love to try! The Almond Toffee Popcorn looks amazing! Yummy in my tummy! I would love to try the Nut & Chew Assortment 30pc 18oz! The almond toffee popcorn looks really good!